Theatrical release post for Lady Bird. Fair Use. This movie has my heart. I watched it last autumn, but decided to re-watch it now to be sure about my feelings and emotions. Well, I confess that my ideas have not changed to date. This movie is about a 17 years old pink-haired girl living in California, who is about to make great changes in her life: falling in love, losing her virginity, enrolling in university, and re-discovering her relationship with her mum. However, it is more than just a coming-of-age movie. It captures what it means to be a 17 years old girl today. 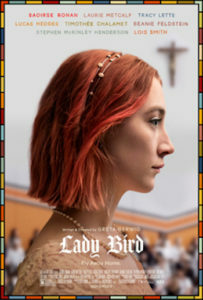 Christine “Lady Bird”, is a final year student at a Catholic high school in Sacramento. She is determined to pursue further studies at university, moving to the East Coast, even if her mother does not agree for money reasons. During her final year, our heroine will discover love, will laugh, party, and fight with her best friend, quarrel with her mum, get a casual job to fund her studies and move to fulfill her academic aspirations. However, the main thread which runs through the movie is the relationship between Lady Bird and her mum. This started as very complicated but, at the very end of the movie, becomes calm. I really believe that the re-discovery of the relationship between mum and daughter is the most important feature that characterizes the reaching of adulthood for a girl. Well, it was like that for me! I remember when I was a young girl, I used to fight and to quarrel with my mum every day. Today, my relationship with her is very different. I can better understand her. More specifically, I know she is not my enemy. Indeed, she wants the best for me. If you missed Lady Bird, please, watch it. You will laugh and cry at the same time.